Reserve your seats now for our Annual Skinny Award dinner on June 19! And a surprise honoree who will be announced at the event! Join us on June 19, 2018 at 6 PM at Casa La Femme, 140 Charles St. in Greenwich Village, for a delicious three course meal with a glass of wine and great company! This is always one of the most joyous events of the year, where we celebrate our victories and gain strength for the challenges to come. Buy your tickets today. Even if you can't make it, please consider making a contribution at the above link in honor of these terrific awardees, and to support our work for small classes, student privacy and parent empowerment going forward. This blog post is by James Eterno, public school teacher and advocate who is retiring after 32 years of teaching. This included many years as a beloved social studies teacher at Jamaica HS, which James valiantly fought to keep open, and three and half years at Middle College high school, as an esteemed member of the Absent Teacher Reserve. Here is a video of James at a Jamaica HS rally. James won our Skinny Award in 2011 as a "teacher-warrior" who gave us the "real skinny" on closing schools. Much wisdom is expressed in his observations below; if only Chancellor Carranza were listening! If only he would hire James as his education advisor! In thirty-two years of teaching in the New York City Public Schools, I have seen educational fads come and go. They are usually disguised as new ideas. I started back in the age of A Nation at Risk. The 1983 report that was required reading in education classes in college said we were a country in trouble because of our educational system, so something had to be done. This led to the education profiteers being able to get rich by curing educational malaise. Every so often there was a new “flavor of the month” that was going to save our children and make them able to compete on the world educational stage. The first I remember at Jamaica High School was minimal expectations. Apparently, in those days we were expecting too much from our young people so we now had to convince them they could all meet basic standards. This was the age of the New York State Regents Competency Tests (RCTs) when students had to pass basic competency exams in math, reading, science, global history and American history in order to graduate, if they could not pass the tougher New York State Regents exams. As the RCT’s were implemented, a whole new industry of test review books allowed people to make money selling the new review guides. Next up in my memory was something called “mastery learning” where the students were allowed to take the tests at the end of each unit over and over until they succeeded. There was no such thing as failure. It slowed us down but mastery was the trend at the time. At this time there was also a big push to make our lesson plans have “power aims.” I really am having a difficult time recalling what a “power aim” was but I do remember we had to have one if we wanted a good review when observed. However, times changed. I once sat with a supervisor who told me that we had to have a focus question in our lessons instead of a power aim. When I asked the assistant principal after listening politely for about twenty minutes on why a focus question was more relevant than an aim if any of this made a difference to the kids, he quickly came back to reality and said no. He was one of the best supervisors I ever had. The next great trend was portfolios (making a comeback today) where we kept everything the kids wrote in huge file cabinets to show how they were growing throughout the year. What a nightmare in a school with space issues. As we moved into the 21st Century, Michael Bloomberg was elected mayor of New York City. In 2002, Governor George Pataki and the New York State Legislature gave the mayor control of the city schools. First we had to have bulletin boards plastered with student work in a certain way, a mandated curriculum, literacy and math coaches in all schools, and only offer “mini lessons” because for most of the class time, students had to be broken up into small groups to talk to each other. A CD put out by the Department of Education proclaimed, “Your students must not be sitting in rows. You must not stand at the head of the class. You must not do ‘chalk and talk’ at the blackboard. You must have a ‘workshop’ in every single reading period. Your students must be ‘active learners,’ and they must work in groups.” This was called the Workshop Model. If we did direct instruction for more than ten minutes, we could be in trouble. Never mind that it may take a much greater time than ten minutes for students to understand the Electoral College or Marbury v. Madison. The kids had to teach themselves for the bulk of the period. I was fortunate at the time that the administration at Jamaica was only partially sold on the Workshop Model. The Workshop Model was succeeded by accountable talk. I’m sorry but I’m still not sure what this was but I was never cited for not doing it so I must have figured it out. At yet a later point during the Bloomberg administration, he gave principals near total authority over their schools. This was called “autonomy” so the Workshop Model was ditched if the principal didn’t like it. Principals could do as they like as long as the test scores and promotion numbers looked good. Another trend was differentiated instruction. We had to personalize our lessons for each student. A great idea but not practical at all as the Regents exams that students had to pass to graduate were not differentiated, and it is near impossible to really “personalize” lessons when there are more than thirty high school students in a class . Strangely, no one ever mentioned reducing class size, instead of these fads, which would actually make sense. There were some other fads that didn’t last long enough for me to process. Whenever someone would come into Jamaica High School to peddle the latest educational cure-all, we cynical teachers would always suspect that someone closely connected to the DOE or State Education Department had won a generous contract, and they would try to convince us that this latest fad was the greatest educational innovation since someone figured out how to put chalk on a blackboard. It was always supposed to be the best invention, that is, until the next one came along. The next boondoggle, the biggest of them all, was the Common Core state standards. Multi-billionaire Bill Gates was behind this one as was President Barack Obama and his Secretary of Education Arne Duncan. They created Race to the Top to make states compete for federal money. We had to use the Common Core if we wanted the federal funds. UFT President Michael Mulgrew threatened to punch anyone in the face who took away his Common Core. Recently, I read about the shifts in instruction with Common Core in California where some students couldn’t even identify what the change was. In New York, they call the Common Core changes to teaching the instructional shifts. Just like with all of the other fads, the Board of Education, now called the Department of Education, sent someone to Jamaica High School to preach the Common Core gospel. This very nice consultant from Australia wasn't just there to do a staff development in 2013 at Jamaica High School that was phasing out by then in part because we wouldn’t play with student numbers; she was going to come every week to show us how to shift our instruction to align to the Common Core. What a year! In social studies we were given a task. We had to come up with a unit in American history on the United States in World War I . This was the Common Core instructions from Engage NY: "Students build knowledge about the world (domains/content areas) through TEXT rather than the teacher or activities." TEXT is now the key to life. The three teachers who were left in the Social Studies Department at Jamaica scoured through what was left of our book room and searched the internet to find as many sources as we could on the United States' entry into World War I, which turned out to be the focus instead of the entire US experience in World War I. Previously, we were told the Workshop Model or power aims would cure cancer but now it’s TEXT. Our Australian instructor wanted us to incorporate as much TEXT as we could and go over it in a number of ways so that we could adhere to the state standards on the "Staircase of Complexity". We had to convince students to "read the central, grade appropriate text around which instruction is centered. Teachers are patient, create more time and space and support in the curriculum for close reading." What that meant in reality was that we had to read the same piece from so many different angles until all of us were completely bored to tears. Meanwhile, we had the United States History and Government Regents exam to worry about too, because those minimum expectations were so 20th Century. By 2013, the educational establishment also wanted “rigor” and our students, many of whom were English Language Learners, had to pass five Regents exams (no more RCT’s) to graduate from high school. We did not have the luxury of spending a week or more reading about and analyzing the United States entry into World War I from seventeen different viewpoints and then reviewing the same texts over and over until we could get up that "Staircase of Complexity" to educational nirvana. We abandoned the project, the staff developer eventually moved on and was replaced by a former DOE administrator who told us that teaching the students all of the topics that might come up on the Regents exam was a smart move on our part -- but there was still the Common Core to adhere to. In the end teachers learned that we had to alter our lesson plans to make sure that we had a standard or two from the New York State Common Core Social Studies Framework on each lesson plan. If we had a standard in the lesson plan, then we were okay for the Common Core part of the lesson if a school level or district level administrator examined our planning. When I moved on after Jamaica closed to Middle College High School, the administration talked the Common Core talk and told us most of us were teaching to the Common Core but I really couldn't tell anyone how I was adhering to the Common Core except I still had to write a Common Core standard on lesson plans that I was writing anew. Middle College is a New York Performance Standards Consortium school so we worked with project based learning instead of worrying about students passing all the Regents exams, since the school is exempt from all of them except English. Having the freedom to explore different ways of teaching and not worrying about a state exam in some ways made me a better teacher. Lower class size at Middle College certainly helped too. The Michael Bloomberg way of trying to quantify everything like Fredrick Winslow Taylor’s early 20th century scientific management to make teaching teacher proof, has proven to be utterly absurd. Yes, fear of closing a school could make teachers pass everyone. If the teachers resisted, Joel Klein just closed the school like he did to Jamaica, and the new teachers in the replacement schools got the message and passed virtually everyone. I had people from two other big high schools in Queens tell me their principals told teachers that they better pass the kids or end up like Jamaica. This is not education; it is playing with numbers, though admittedly it did raise our graduation rates. On the other hand, New York City sends so many students to college totally unprepared for the challenge so the college graduation rates are not exactly rising like the high school graduation rates. Teaching is more an art than a science. What works for me is usually throwing out a topic and then seeing where the discussion goes. If it goes in the right direction, I ask the students to do further research in the area. It doesn't work in every class or with every student. My style will not necessarily be right for other teachers. What works for them may not be a good fit for me. There are as many different teaching styles as there are teachers and students have different learning styles. At Middle College High School and sometimes at Jamaica, we learned from other teachers as we did inter-visitation. When I look back, most of the best advice I received came from just talking to other teachers. If the past is a guide, Common Core will run its course and be replaced by some new educational fad that some salesman will say is going to make every student ready to be Albert Einstein. Instead, it might help if the powers that be at the State Education Department and the NYC Department of Education would just listen to teachers as well as independent research and reset this whole mess. We won in court today to keep PS 25 open -- probably for at least another year! See also my open letter to Chancellor Carranza in today's Washington Post Answer Sheet , urging him to revoke the decision of the previous Chancellor to close PS 25, and an article in the CSA News. The NY Post , Politico, and Bklyner also wrote about our win in court. 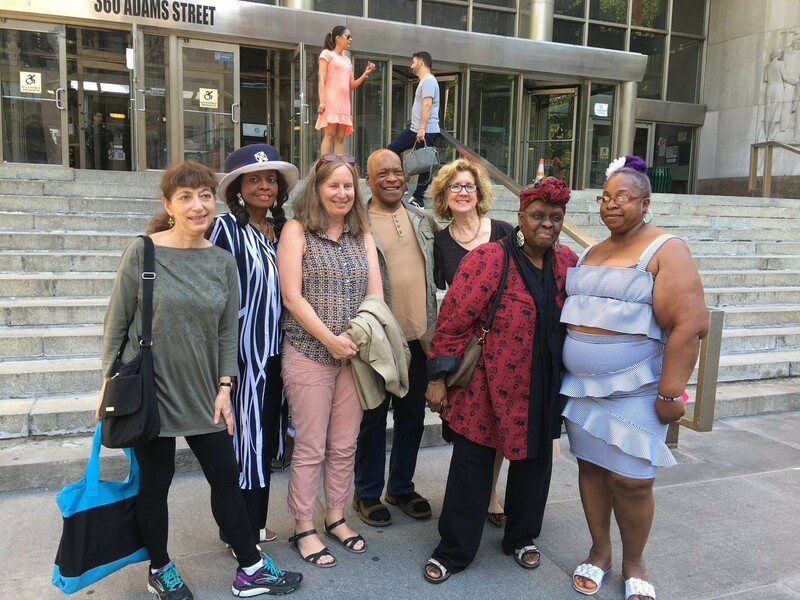 Today in court, we won our temporary restraining order to keep PS 25 open! Judge Katherine Levine of the Kings County Supreme Court issued a decision from the bench that unless she has an epiphany in the next two weeks, the school will remain open next year and she will decide the complex legal merits of the case more carefully over the next few months. She seemed impressed with our research showing how all the other 33 schools DOE offered these students to apply to 1- all had far lower positive impact ratings 2- many of them were miles away, 19 of the schools in Staten Island alone 3- 25 were overcrowded, and 4- none had class sizes as small as PS 25. And the DOE has not offered to provide busing for the students. In short, she was impressed that in most every other proposal to close schools, the DOE had promised higher performing schools that students could apply to, but they didn’t in this case, because according to DOE's own estimation, there are only three other public elementary schools as good as PS 25 in the entire city and they are full. In fact, the City itself admitted in their response papers to the lawsuit that according to the school performance dashboard, PS 25 is the "second best public elementary school in Brooklyn and the fourth best in the City, and that PS 25 outperforms charter school other than Success Academy Bronx 2 in its positive impact on student achievement and attendance." The Judge was concerned that there was little case law on this subject, but Laura explained the precedent of the Grinage case, in which in 2009, the NYCLU sued the DOE to block the proposal to close three zoned schools without a vote of the CECs. Chancellor Klein, not a risk averse attorney himself, promptly withdrew these proposals just two weeks after the lawsuit was filed. Yet incredibly, today in court, the City's attorney claimed that nine years later, Grinage was "still pending." The Judge asked if the CEC hadn’t voted to approve this, what public input was there? The DOE explained there were public meetings, etc. where parents expressed their concerns. The Judge said but you don’t have to listen them, right? Is that the DOE’s position? Finally, she asked the attorneys as regards the temporary restraining order: what’s the balance of harm? What the worst that happens if I leave the TRO in place? The PS 25 students have the benefit of an excellent school for another year? The City attorney tried to argue this would hold up assignments for all other 3000 kids at closing schools, but as the Judge responded, that was a "ridiculous" argument. All those transfers and assignments can go through, this will only affect the students at PS 25. (Actually there aren’t 3000 kids in closing schools – instead there are about 2000 kids in all and 661 in elementary schools, but none of them will be affected but the students at PS 25, whose parents want them to stay). We were all whooping it up inside the courtroom when the Judge issued her decision from the bench, including PTA Vice President Crystal Williams, one of the plaintiffs. Afterward, we all hugged and expressed huge relief. Above is a photo after the hearings of PS 25 parents, supporters and our attorney Laura Barbieri, in front of the Kings County court house. I just heard from Darcy Griffin, the PTA president, that the parents at PS 25 were all thrilled when they picked up their kids and heard the news. Let's hope that the Chancellor withdraws the proposal to close this terrific school, as I urged him to do in today's Washington Post; which not only would serve the case of justice, preserve this excellent school, save the parents, teachers, and students at PS 25 much anxiety, and city taxpayer money. The negative impact on PS 25 families would be severe if this closure is allowed to go forward, especially for the large number of homeless students, because the school is a sanctuary of stability in their lives. As Mark Cannizaro, the president of the CSA, the New York City principals’ union, has said, “the students, families and educators of PS 25 deserve better.” Instead of closing this exceptional school, we urge you to honor PS 25’s achievements, emulate and expand it — and enable more NYC schools and students to have the same chance to succeed. The memo of law explains the legal basis for why the DOE must keep PS 25 Eubie Blake open until the court is able to make a final decision on the legal merits, including the irreparable harm to its students if the school closes this year and they have to transfer to lesser schools. 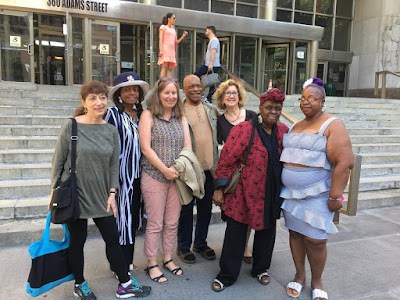 Parents' Legal Petition Against the Closure of PS 25 This verified petition explains the background of the case, including PS 25's high quality, and the legal argument for why the DOE does not have the right to close the school. Affidavit of Leonie Haimson, Class Size Matters My affidavit explaining the research showing the importance of class size, and how PS 25's small class sizes are a critical reason for the school's success. Appendix to Leonie Haimson's Affidavit: Summary of Class Size Reduction Research on the proven benefits, in the short term and long term, of small class sizes, especially disadvantaged children who make up the overwhelming majority of PS 25 student population. Affidavit of Crystal Williams Crystal Williams, parent of two students at PS 25 and the Vice President of the PS PTA, explains how PS 25 has helped her children and why she and other parents oppose its closure. Order to Show Cause and Request for Temporary Restraining Order to Stop the Closure of PS 25 This document requests that the court prevent the DOE from taking any further steps to close PS 25 until the court decides on its legality. Verified Answer of DOE in PS 25 Case The DOE explains why they want to close PS 25 – though they admit on p. 3 that according to their school performance dashboard, it is the 2nd best public elementary school in Brooklyn and the fourth best n the city and outperforms all other charter schools than Success Academy Bronx 2 in its positive impact on student achievement and attendance. Analysis of Public Comments on the Closure of PS 25 This document summarizes the various public hearings, etc. held about the school's proposed closure, revealing widespread public opposition to the plan. The Department of Education's argument explaining why they should have the right to close PS 25 before the court makes a final decision on the merits of the case.